After all, Canadian economic fundamentals remain abysmal by any standards, because of the collapse in commodity prices and a decline in exports to its biggest trade partner, the US. “Canada’s central bank has said the country’s gross domestic product fell 7.3 percent in the first three months of 2009, dropping at the steepest pace in decades. The Bank of Canada said that’s the biggest contraction since comparable records began being kept in 1961.” Meanwhile, the economy has shed almost 300,000 jobs, and the government is predicting a record budget deficit of 50 billion Canadian dollars. Due in part to a rise in commodity prices (which could soon make it profitable for drilling of the famous oil sands) as well as the government’s $32 billion economic stimulus package, Canada’s luck is expected to turn. The economy is now expected to grow by a healthy 2.5% in 2010, following a projected decline of 3% in 2009. This return to prosperity will be made possible be a shift in economic strategy, as a part of which East Asia could supplant the US as Canada’s biggest export market. 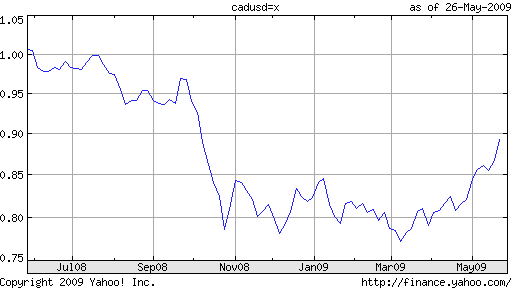 So, why is the Loonie rising? In a nutshell, it is for the same reason that most other currencies are outperforming the Dollar. One analyst offered the following pithy summary: “This is not a made-in-Canada story, but a negative U.S. dollar story.” In other words, currency traders are focusing more on lowered risk aversion and the Fed’s money printing activities, rather than economic fundamentals. As commodities and stocks recover, the Loonie is being driven up indirectly- not because investors suddenly perceive it as having some kind of economic advantage.